If you are one of the many first time homebuyers out house hunting then you are probably hoping to cash in on that 8k dollar tax credit. Click here to sign up for one of our free first time home buyer seminars! The good news is that almost everyone can qualify! The tax credit is basically FREE money the government is giving away just to get you into a home! The most important thing you need in order to qualify, is to not have owned a home (or had interest in a home) in the past 3 years. The even better news is that there is still time for you to cash in!! Buyers have until April 30, 2010 to be under contract on a home (the home must close by June 30, 2010). So if you don’t want to miss out on all this cash then it’s time to get serious about the house hunt! Learn everything you need to know about buying your first home and the first time home buyer tax credit! Together with Watson Realty we are organizing FREE First Time Home Buyer Seminars to be held on Thursday, April 1st and Thursday, April 3rd in Lake Mary FL. Title Issues and differences in closing a Bank Owned Property. After the presentation, break out sessions will be held on the specific subjects so you can ask detailed questions, set appointments with our mortgage lender to get pre-qualified (same day if you wish) or meet with one of our neighborhood experts to determine the neighborhood of your choice and set up a search. We will also show you how to best utilize your free private home search page so you won’t miss out on the market’s hottest real estate deals. 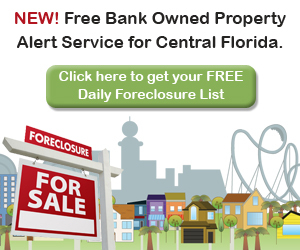 Free foreclosure lists are available upon request. Refreshments and cookies will be served! Space is limited, RSVP today to reserve your seat!